Hey...it's me Jones. I just wanted to write you a little note regarding this whole world ending in 2012 fiasco. Here's the deal if that could NOT HAPPEN I'd be really grateful. I've got a lot to do in my life and it's going to take longer than 2 years for those things to happen. For example, I need to find a boyfriend who will then marry me so I can then have a kid that is as equally as weird as me. I can't make that happen in two years. I can barely take care of myself right now let alone a baby. This morning instead of putting on lotion that I tend to use everyday I (without double checking) used Dove Lotion for Men that my dad uses and now smell like dude. Not to mention I'm going to need a little extra time for Sam Poueu to get to know me. As I've mentioned before I'd also like to meet every member of *NSYNC and seeing as Chris Kirkpatrick might actually live in Iceland because that's the only place he'd still be considered a superstar I'm gonna need that to be a functioning place, preferably not filled with liquid hot magma. I have other things that I'd like to do too. Traveling would be nice. However with this monster you're unleashing it's making that difficult. If things continue down this path I won't be able to go anywhere. According to various sources, celebrities are being grounded everywhere due to this ash. Brad Pitt isn't able to travel! Selena Gomez is stuck in London! MILEY AND LIAM COULDN'T GO TO THEIR LONDON PREMIERE. You know how I love my celebs Mutha Nature. I can't have these sort of delays. How will I know what Brad and his scraggly beard are doing if they aren't state side? That's right, I aged like 25 years and changed outfits. 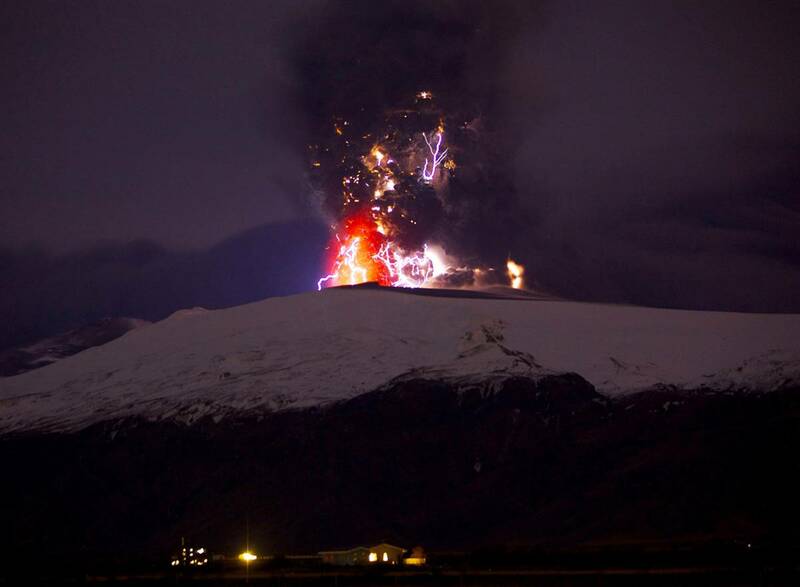 Um...lightning in a volcano? If you throw a few spiders in there add sharks falling from the sky and threat of having a sit down lunch with Carrot Top you have officially found my worst nightmare. Perhaps you are trying to rid yourself of the Snowtorious B.I.G. image and think of something more edgier and hip,ash-tronomical even but I'm all set Mother Nature. My fear of the world ending in 2012 is growing by the day. I'll do whatever you want to make this stop. I'll use recycled bags, I'll volunteer at oil spill sites, I'll adopt a highway, Orca whale, whatever the F you want. Just knock it off OK? P.S. If it's not too much to ask the pollen count this year is really high-- I'm pushing my luck? OK forget I mentioned it. hahahaha LK. I love when you say that. haha. 60% on a one-year, fixed interest rate bond, now you need to lock your hard earned money away for 4 to 5 years to bag that kind of return. people with a bad credit score low income it just isn't that hard to obtain poor credit used car loans; this procedure is incredibly similar to getting loans with good credits. in areas that do not require a bachelor's degree, for example fiber installers, electricians, and mechanics. This is to let the public know that Mrs. Charity White, a private lender has a financial opportunity for all those who need financial assistance, pay bills, to invest in new businesses or to improve your business. We provide loans with interest of 2% to companies and individuals. This does not require a lot of documents, also clear and sensitive terms and conditions. Contact us via e-mail: (charitywhitefinancialfirm@gmail.com) We will provide our best services.